As well as the high-tech interventional advances including radial access percutaneous coronary intervention (PCI), new antibodies against cholesterol, and coronary angiography for heart disease diagnosis, maybe the most important studies presented at this year’s American College of Cardiology (ACC) focused on the considerably low-tech interventions of avoiding sitting for too long, and losing weight to reduce important cardiovascular risk factors. We report from the 64th Annual Scientific Session held in San Diego, California, USA from 14th–16th March 2015. Sitting for many hours per day is associated with increased coronary artery calcification, a marker of subclinical heart disease, a new study suggests. The study found no association between coronary artery calcification (CAC) and the amount of exercise a person gets, suggesting that too much sitting might have a greater impact than exercise on this particular measure of heart health. Other studies published recently have linked excess sitting with an increased risk for cardiovascular disease, diabetes, cancer and early death. This study suggests that the mechanism behind these observations may be coronary calcium. For the study, Dr Kulinski and colleagues analysed data from 2,031 participants in the Dallas Heart Study who had undergone a computed tomography (CT) scan to measure CAC. All participants wore a watch accelerometer for at least four days to measure body movements, which were classed as sedentary, light activity, or moderate to vigorous physical activity. On average, participants were sedentary for 5.1 hours a day, but this ranged from 1.1 to 11.6 hours a day. Results showed that each hour of sedentary time per day on average was associated with a 14 % increase in CAC burden. The association was independent of exercise activity and other traditional heart disease risk factors. “I think the study offers a promising message. Reducing the amount of time you sit by even an hour or two a day could have a significant and positive impact on your future cardiovascular health,” Dr Kulinski said. The antiplatelet agent, ticagrelor, was associated with a reduction in myocardial infarction (MI), stroke, or cardiovascular death versus placebo in secondary prevention patients, but this was accompanied by a higher risk of clinically significant bleeding and transfusion, as well as a higher rate of dyspnoea in the PEGASUS-TIMI 54 (Prevention of Cardiovascular Events in Patients with Prior Heart Attack Using Ticagrelor Compared to Placebo on a Background of Aspirin-Thrombolysis in Myocardial Infarction) trial. Presenting the results, Dr Marc Sabatine (Brigham and Women’s Hospital, Boston, USA) said he would “consider such therapy as long as it was well tolerated”. But writing in an editorial (doi: 10.1056/NEJMe1502137) accompanying publication of the PEGASUS-TIMI 54 paper (doi: 10.1056/NEJMoa1500857) in the New England Journal of Medicine Dr John F Keaney Jr (Massachusetts Medical School, Worcester, USA) points out the “fragile balance between efficacy and adverse events” and asks whether dual platelet inhibition with high-potency agents is approaching the point of diminishing returns. Dr Sabatine explained that dual antiplatelet therapy is recommended for the first year after an acute coronary syndrome (ACS) event; post-hoc analysis from the CHARISMA (Clopidogrel and Aspirin versus Aspirin Alone for the Prevention of Atherothrombotic Events) trial suggested that prolonged therapy might be beneficial for patients with a prior MI. The PEGASUS-TIMI 54 study involved 21,162 patients who had had an MI a mean of 1.7 years previously. They also had at least one additional risk factor: age 65 years or older, diabetes, a second prior MI more than a year ago, multi-vessel coronary artery disease, or chronic kidney disease. Patients were randomised to high dose (90 mg twice daily), low dose (60 mg twice daily) ticagrelor or placebo, with all patients continuing to take aspirin. Results (see table 1) showed that after a median follow-up of 33 months, both doses of ticagrelor significantly lowered the risk of the primary composite efficacy outcome – cardiovascular death/MI/stroke. But this was at the cost of a two- to three-fold increase in major bleeding and risk of dyspnoea. The researchers point out that the lower dose of ticagrelor may offer a more attractive risk/benefit profile. They estimate that for every 10,000 patients who began treatment, taking 90 mg ticagrelor twice daily would prevent 40 primary end points and lead to 42 TIMI major bleeding events per year, whereas taking 60 mg ticagrelor twice daily would prevent 40 primary end points and lead to 31 TIMI major bleeding events per year. While fatal bleeding and non-fatal intracranial haemorrhage occurred in less than 1% of patients in each group, they note that the study excluded patients with recent bleeding, prior stroke, or on anticoagulants, so “the safety profile of long-term ticagrelor should not be generalised to people at high risk of bleeding”. 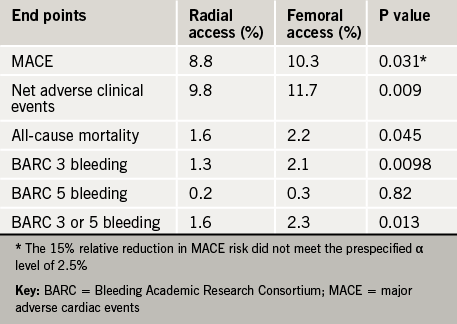 Radial access percutaneous coronary intervention (PCI) was associated with a large significant reduction in both major bleeding and all-cause mortality compared with femoral artery access in the MATRIX study in acute coronary syndrome (ACS) patients. Lead investigator, Dr Marco Valgimigli (Erasmus Medical Center, Rotterdam, the Netherlands) said the results “are so compelling that radial access should be the first approach for interventionalists treating ACS patients undergoing invasive management”. The MATRIX (Minimising Adverse Haemorrhagic Events by Transradial Access Site and Systemic Implementation of angioX) study follows on from the RIVAL (Radial versus Femoral Access for Coronary Angiography and Intervention in Patients with Acute Coronary Syndromes) trial which did not show a reduced rate of cardiovascular events or major bleeds with the radial approach but did find a large reduction in the risk of large vascular-access complications. Dr Sanjit Jolly (McMaster University, Hamilton, Canada), who led the RIVAL study, said he thought MATRIX “will be the study to change guidelines”. The MATRIX study randomised 8,404 ACS patients (48% ST-elevation myocardial infarction) to PCI with transradial versus transfemoral access. Results (table 1) showed a reduction in the co-primary end point of net clinical events (death, myocardidal infarction, stroke, and major bleeding), which was driven by a 33% relative reduction in the rate of major bleeding and a 28% reduction in all-cause mortality. The MATRIX study was published online in The Lancet (doi: 10.1016/S0140-6736(15)60292-6) on 16th March 2015 to coincide with its presentation at the ACC meeting. A second part of the MATRIX trial compared bivalirudin with unfractionated heparin as the antithrombotic regimen used during PCI, and found no significant difference with regard to the co-primary endpoints. However, bivalirudin was associated with a significant reduction in cardiovascular death and all-cause mortality, as well as a significant reduction in any bleeding measures including non–access-site bleeding, bleeding requiring a blood transfusion, and fatal bleeding. Trying to explain how the two primary composite end points could have not been reduced when there were large relative reductions in death and bleeding, lead investigator Dr Marco Valgimigli pointed out that death and bleeding, contributed relatively little to the composite end points, which were dominated by myocardial infarction, which was higher than expected. In response, Dr Jolly pointed out that “mortality is the most important part of the primary outcome”. He added that the mortality benefit is hypothesis-generating at this point, but a meta-analysis of the various bivalirudin studies may confirm the finding. These results from the MATRIX trial with bivalirudin appear to conflict with those from the HEAT-PPCI (How Effective Are Antithrombotic Therapies in Primary PCI) study, reported last year, which showed a significantly lower rate of MACE in heparin-treated patients compared to those given bivalirudin and no differences in bleeding complications. A meaningful reduction in the burden of atrial fibrillation (AF) can be achieved just by losing weight, a new study suggests. The study included 355 adults with AF and a body-mass index (BMI) of at least 27 kg/m2 who were enrolled in a long-term weight loss programme. The programme included three in-person visits per month, detailed dietary guidance, low-intensity exercise, support counseling and maintenance of a daily diet and physical activity diary. Participants returned to the clinic annually for a health examination, including an echocardiogram and AF monitoring which involved completing questionnaires and wearing a Holter monitor for seven days. After an average of four years, there was a significant inverse relationship between the amount of weight lost and AF symptoms (see table 1). Sustained weight management and a linear weight loss trajectory were also associated with greater freedom from AF. Patients who lost and then regained weight, causing a fluctuation of more than 5% between annual visits, were twice as likely to have recurrent rhythm problems than those who did not experience such fluctuations. Weight loss was also associated with significant beneficial structural changes in the heart and other markers of heart health including blood pressure, cholesterol and blood sugar levels. In an analysis that took all of these factors into account, patients who lost at least 10% of their body weight were six times more likely to achieve freedom from AF than patients who lost less than 3% of their weight or gained weight. This study was published online in the Journal of the American College of Cardiology on 15th March 2015 (doi: 10.1016/j.jacc.2015.03.002). Daily supplementation with folic acid reduced stroke risk by more than 20% in a Chinese hypertensive population in the CSPPT (China Stroke Primary Prevention Trial). The trial included 20,702 adults with hypertension but without a history of stroke or myocardial infarction (MI) who received enalapril 10 mg plus folic acid 0.8 mg daily or enalapril alone. Results (see table 1) showed that after an average of 4.5 years of follow-up, those taking folic acid had a 21% reduction in the risk of having a first stroke. The folic acid group also showed significant risk reduction in first ischaemic stroke and a composite of cardiovascular events, but not in haemorrhagic stroke or MI. Presenting the study, Dr Yong Huo (Peking University First Hospital, Beijing, China), explained that in contrast to the West, mortality from stroke is rising in China. He also pointed out that folate deficiency is very common in China, occurring in 20−60% of individuals. However he added: “We believe these findings are universal. They”re applicable not only to the Chinese population but also populations throughout the world”. The study was published in JAMA (doi: 10.1001/jama.2015.2274)to coincide with its presentation at the ACC. In an accompanying editorial (doi: 10.1001/jama.2015.1961), Drs Meir Stampfer and Walter Willett (Brigham and Women’s Hospital and Harvard Medical School, Boston, USA) say the trial has “important implications for stroke prevention worldwide”. “This study seems to support fortification programs where feasible, and supplementation should be considered where fortification will take more time to implement,” they conclude. The latest data with the new PCSK9 inhibitor cholesterol-lowering drugs continues to show reductions in low-density lipoprotein (LDL) greater than ever achieved before and preliminary outcome results suggest a halving of major cardiovascular events. These latest results come from long-term follow up of the OSLER-1 and OSLER-2 trials with evolocumab (Repatha®, Amgen) and the ODYSSEY Long Term trial with alirocumab (Sanofi/Regeneron). “And all the data we have point to the fact that the reduction in clinical events is tied to the reduction in LDL cholesterol,” he added. The OSLER (Open Label Study of Long Term Evaluation Against LDL-C) programme included a total of almost 4,500 patients who had been included in previous phase 2 or 3 studies with evolocumab. They had been assigned for approximately one year to either standard therapy alone (n=1,489) or with an injection of evolocumab (n=2,976) taken once every two weeks at a dose of 140 mg or once monthly at 420 mg. The primary end point was treatment-related adverse events which occurred in 69.2% of the evolocumab group and 64.8% of the standard-therapy group. Serious adverse events occurred in 7.5% of each group. Neurocognitive adverse events were reported in 0.9% of the evolocumab patients versus 0.3% of those in the standard therapy group. LDL cholesterol was lowered by 61% in the evolocumab group (from a median of 120 mg/dL [3.10 mmol/L] to 48 mg/dL [1.24 mmol/L]), and adverse cardiovascular events occurred in 2.18% of the standard-therapy group versus 0.95% of the evolocumab group (p=0.003). The ODYSSEY Long-term trial included 2,341 patients considered to be at high risk for cardiovascular events, with LDL cholesterol levels of at least 70 mg/dL (1.81 mmol/L) and receiving a maximum tolerated dose of statins. They were randomised to 150 mg alirocumab (every two weeks) or placebo. LDL cholesterol was lowered by 61% for the alirocumab group to 48 mg/dL (1.24 mmol/L) versus 0.8% (to 119 mg/dL [3.08 mmol/L]) for the placebo group. After 78 weeks of treatment, major adverse cardiovascular events had occurred in 1.7% of the alirocumab groups versus 3.3% of those receiving placebo. Treatment-related adverse events that were more prevalent in the alirocumab group versus the placebo group included injection-site reactions (5.9% vs. 4.2%), myalgia (5.4% vs. 2.9%), and neurocognitive issues (1.2% vs. 0.5%). Both the OSLER and ODYSSEY trials were published in the New England Journal of Medicine (doi: 10.1056/NEJMoa1500858 and 10.1056/NEJMoa1501031) to coincide with their presentation at the ACC. Two new studies presented at the ACC meeting have shed more light on the role of anatomic testing with coronary computed-tomography angiography (CTA) as a diagnostic tool for coronary artery disease. PROMISE (Prospective Multi-center Imaging Study for the Evaluation of Chest Pain), CTA did not improve clinical outcomes compared with functional testing but did increase overall radiation exposure. However in the SCOT-HEART (CT Coronary Angiography in Patients with Suspected Angina due to Coronary Heart Disease) trial, CTA clarified the diagnosis in one in four patients, led to investigations being changed in one in six patients, treatment being changed in one in four patients and was associated with a 38% reduction in subsequent myocardial infarction (MI) rate, although this was not statistically significant. In trying to explain the seemingly different results, SCOT-HEART author, Dr David Newby (Centre for Cardiovascular Science, University of Edinburgh) pointed out to the BJC that the studies had very different designs and inclusion criteria. The main difference was that PROMISE assigned patients to CTA or a stress test. In SCOT-HEART patients had standard of care (which included a stress test in 85% of cases) and they were then randomised to CTA or no CTA. Dr Newby concluded that “CTA should be performed where there is uncertainty about the diagnosis, investigation or treatment of the patient presenting with chest pain”. The PROMISE trial involved 10,003 symptomatic patients, who were randomised to CTA or functional testing with exercise electrocardiography, nuclear stress testing, or stress echocardiography. After a median follow-up of two years, the primary end point − a composite of death, MI, hospitalisation for unstable angina, or major procedural complications − occurred in 3.3% of those who received CTA versus 3.0% of those given functional testing. Lead author, Dr Pamela Douglas (Duke Clinical Research Institute, Durham, USA) noted that the low event rate in the study made it very unlikely that any difference between the two strategies would be seen. Commenting on the PROMISE results, chair of the ACC.15 meeting, Dr Athena Poppas (Rhode Island Hospital, USA), said the data suggest that “functional testing is still the best first step for patients in whom coronary disease is suspected”. The PROMISE trial was published in the New England Journal of Medicine (doi: 10.1056/NEJMoa1415516) to coincide with its presentation at the meeting. The SCOT-HEART trial included 4,146 patients, who had been referred for assessment of suspected angina due to coronary heart disease. Of these patients, 47% had a baseline clinic diagnosis of coronary heart disease and 36% had angina due to coronary heart disease. At six weeks, CTA reclassified the diagnosis of coronary heart disease in 27% of patients and the diagnosis of angina due to coronary heart disease in 23% patients. This changed planned investigations in 15% of patients and treatments in 23%, but did not affect six-week symptom severity or subsequent admittances to hospital for chest pain. After 1.7 years, CTA was associated with a 38% reduction in fatal and non-fatal myocardial infarction (26 vs. 42, HR 0.62, 95% CI 0.38–1.01; p=0.0527), but this was not significant. In an editorial (doi: 10.1016/ S0140-6736(15)60463-9) accompanying publication of the SCOT-HEART trial (doi: 10.1016/S0140-6736(15)60291-4) in The Lancet, PROMISE author Dr Pamela Douglas urged caution in the interpretation of the reduced MI rate as it was one of 22 secondary end points.